Habib Wahid is a Bangladeshi musician and singer. He is accomplished with different genres of music like pop, EDM and traditional Bengali folk and that sets him apart from everybody. He has given an array of hit tracks like Hridoye Amar Bangladesh, Din Gelo Tomar, Bhalo Bashbo, Maya and more. We provide the compilation of karaoke tracks at our website. 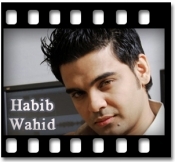 Browse through your favorite track of Habib Wahid and buy now.